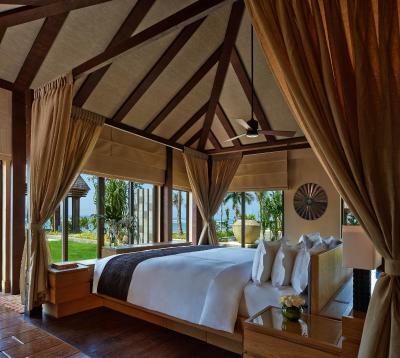 This luxurious resort features a beachfront setting complete with an on-site spa and wellness centre, business facilities, 3 restaurants, 3 bars, and outdoor pools. It also offers free WiFi access in all areas of the property and free on-site parking facility. It takes a 15-minute drive from the property to Bali Collection Shopping Centre and Bali Convention Centre, and about a 30-minute drive to Garuda Wisnu Kencana Cultural Park. The majestic Uluwatu Temple is reachable within a 40-minute drive. Getting to Bali Denpasar International Airport will take around 30 minutes by car. The resort offers airport shuttle service at an additional fee. 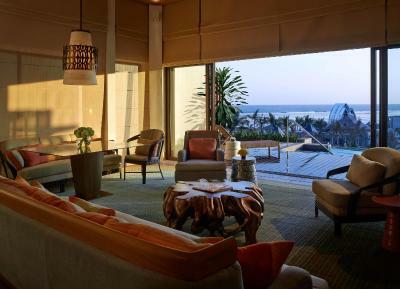 The Ritz-Carlton Bali presents spacious suites and villas where each one boasts an opulent tropical lifestyle with their beautiful furnishings, flat-screen satellite TV and DVD player, air conditioning, seating area with sofa and minibar. All the villas have private pool, dining area, kitchenette, and living area. Guests can enjoy either the view of the pool or the expansive and panoramic view of the ocean. All of the three on-site restaurants and bars offers arrays of amazing Japanese, Italian and International cuisine, as well as refreshing beverages.